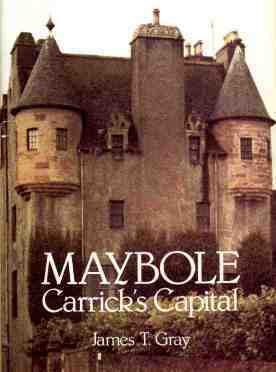 Maybole, Carrick's Capital Facts, Fiction & Folks by James T. Gray, Alloway Publishing, Ayr. First published 1972. Copyright © Permission for display on this site granted by David Gray. You may view and download chapters of this book for personal research purposes only. No other distribution of this text is authorized. The story of this ancient Ayrshire town from its early beginnings in the 12th century through its growth and development until the nineteen sixties. A fascinating record of the history of a town including a wealth of factual information on its outstanding buildings growth of industry etc., the book also gives an insight into the life of the community and townsfolk themselves. AT the end of the eighteenth century the Rev. James Wright, who was inducted Minister in Maybole in 1770, wrote an account of the town and district for inclusion in the Statistical Account of Scotland and his article gives an interesting insight into the life of the townspeople of that period. He was of the opinion that the town derived its name from the "ancient game called maypole, because in the town there was a piece of ground, about an acre in extent, called the Green of Maybole, where people from the town and district gathered for the purpose of enjoying the diversion of the maypole". This is the only instance where this derivation is given and as it is unlikely that maypole dances were in great vogue in the twelfth century it is hardly reasonable that the old town was so noted for this pastime that its name was a corruption of it. The Town Green (or Ball Green) was certainly the gathering place of the townspeople for generations and many sporting activities took place there such as archery, playing of bowls, football, etc. but there is no reason that maypole dancing should have been singled out to give a name to the town. In the seventeenth century the Magistrates of the Town passed a byelaw prohibiting the playing or "Byasse bowls" on the Town Green on Sundays, and Sir Walter Scott mentions Maybole in one of his books as one of the last towns in Scotland where the archery game of shooting at the popinjay was practised. The Rev. Wright describes Maybole as situated on a ridge of high ground with a fine south exposure and amply supplied with excellent water from many springs and wells. He ascribes the excellent health of the eighteenth century townsfolk to the situation and good water supplies and mentions that Mr. David Doig, schoolmaster in the town and a woman also within the burgh both died in the 1780s aged 104 and 105 years respectively. He also records that in 1790 there were ten persons living within the town whose combined ages exceeded 900 years, so Maybole must have been a very healthy place and noted for the longevity of its townsfolk in those days. The population of the Parish had increased to about 3,000 by 1792 from the total of 2,058 recorded by Dr. Webster in 1755, quite a large increase in forty years. The trade was mainly weaving and at the end of the 18th century there were about eighty cloth looms and two dozen cotton looms in use in the town, employing over three hundred weavers. This was a very large proportion of the townspeople as there were only eight hundred of the population within the Burgh over eight years of age. The produce from the looms was mainly woollen blankets and about 10,000 stones of wool was woven yearly giving approximately 300,000 yards of cloth or blankets which were sold for an average of one shilling per yard at the public markets in Maybole and Ayr, four such markets being held yearly in each town. The wool was purchased by cloth merchants and supplied to the weavers who were paid an average of l-d per yard for their work and therefore a weaver's wage at that time would be in the region of seven shillings per week which compared quite favourably with wages for other tradesmen at that period. The schoolmaster who taught in the small thatched schoolhouse at the foot of the Town Green had an annual salary of 300 merks Scots (16.13.4-dstg.) while the ministers stipend was 63 boIls 2 pecks of meal and £73 Scots with the free occupancy of a manse and glebe. About the end of the 18th century farming in the district was improving greatly and in 1797 the Carrick Farmers Society was formed, the members consisting of nearly all the local lairds, a great proportion of the farming community and, curiously enough, all the clergymen in the district. The first President of the Society was the Rev. John Ramsay of Kirkmichael who was the founder of it and a leading agriculturist in his day. Two cattle shows were held yearly and four regular meetings were held annually in the Kings Arms Hotel in Maybole when articles on farm management were read and discussed. Prizes were given for the best kept farms and for the best fields of green crops, etc. and books were purchased on new methods of farming and passed round the members. In addition there was a fund raised to give grants to members who met hard times and altogether it was a thriving and prosperous Society with funds amounting to £575 in 1837. The Society was in existence until the middle of the 20th century when, due to lack of support, it was disbanded and its trophies handed over to the Ayrshire Agricultural Society for competition in special classes confined to Carrick Farmers at the annual Ayr Cattle Show. The writer of the Statistical Account was not greatly enamoured of the local school or church and described the former as "an old mean thatched house, very unsuitable to the eminent characters, which, at different times have been educated in it" and the church as a "large but mean structure". The only other building referred to in the town is "a very old building, commonly called the College, the walls of which are still standing, and the area within them is used for the burying place of the family of Cassillis". It is odd the minister only recorded these three buildings, as at that period the Castle and Tolbooth at each end of the Main Street must have dominated the other buildings and there were many other town residences of local lairds which one would have thought worthy of mention. In the Rev. Wright's article he lays great stress on the number of the poor in the parish, which he states "was very considerable", and in his opinion this was caused partly because of the great numbers of unemployed inhabitants and partly by the large influx of Irish vagrants about this period. He complains bitterly that nothing was given by the heritors towards the upkeep of the poor who were wholly maintained from church collections each Sunday. As most of the heritors did not attend the church it was left to the townspeople who did attend to give contributions to the Poors Fund, and as the townspeople were themselves poor there was very little to distribute among the needy and it was, as the writer said, "a case of the poor maintaining the poor."